Taxi drivers in Paris are the stuff of legend. And urban myth, too, perhaps. In all my Paris taxi rides, I have had only one driver who was less than wonderful. (That is, when I could actually get a taxi. But that's another story, and a long one.) I know that other people will differ with me; maybe I've just been lucky? Or maybe St. Fiacre was looking out for me. Who in tarnation is St. Fiacre, you ask? Why, he is none other than the patron saint of French taxi drivers. And this week he will have a new statue in his honor unveiled. The term fiacre was used originally for the early horse-drawn carriages for hire in Paris. So the next time you need to hail a cab in Paris, maybe if you make a special pryaer to St. Fiacre, it might help. Can't hurt. God bless that St. Fiacre! 1. I telephoned one to fetch me at my apartment on the place de la Madeleine, and the driver said "Non, Madame, I cannot -- there is a manif [street protest] in your neighborhood and the traffic is blocked." (His taxi stand was around the corner, so he knew what the real situation was, but he was apparently acting on official traffic reports from the Prefecture de Police). I said, "Monsieur, I must tell you, I have the best view of the Madeleine of anyone, and I promise you that the traffic has completely cleared up. In fact, feel free to call me any time if you want a really good traffic report!" He perked up and said, "Okay, I'll be there in 2 minutes." 2. 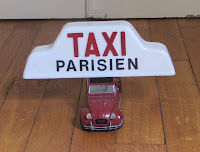 Another day I was bringing home two antique wooden chairs I bought at the Marche aux Puces in Vanves, and although I called the number for extra-large taxis, a regular size taxi showed up. The driver snarled, "You are moving furniture. Do I look like a moving man?" "No," I replied sweetly, "you look like a very kind chauffeur de taxi." He melted like butter. Even helped me move the chairs into the vestibule when we arrived. 3. It is after midnight. I am riding home in a taxi from a farewell dinner. "Brrr. Il fait froid," says the driver. "Moins 2." We make pleasant chit-chat and I note with irony that just as I'm leaving Paris I'm beginning to recognize the Celsius temperature readings without a mad mental scramble to do the math. 4. And this, my all-time favorite. After one Saturday dinner party in Paris, it being late I decided to take a taxi home. The reluctant driver picked me up -- I was his last fare of the evening -- and we drove from the Champs Elysees to my place in the 7e arrondissement. We arrived at my doorstep and I explained that all I had was a 50-euro bill. You would have thought I had committed highway robbery. I got the most severe tongue-lashing, with expletives, him furiously spouting, "If I had known you wanted to pay me with a 50-euro bill, I wouldn't have picked you up," and so forth. I apologized profusely, to no avail. Finally, he gave me the change for the 11-euro fare -- change which he had in abundance, it turns out. Do you have any Paris taxi stories? Any prayers for St. Fiacre? The unjust law which for centuries has denied the freedom of certain French citizens to choose their personal lifestyle has finally been repealed. That’s right. As of last Thursday, French women can choose to don a pair of pants from their armoire, and not be illegal. For the past few years there has been an outcry to get this outdated law off the books. And now it is a fait accompli.